Toyota with the success of previous models i.e. 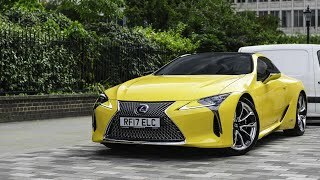 Lexus and Lexus LC, now brings another glamorous expansion of Lexus “Lexus LC 500h 2017”. It comes with outstanding modifications to give the most sporting and engaging drive from the other Lexus hybrid. Company brings this model into the market by seeking inspiration from the award-winning LF-LC concept car. 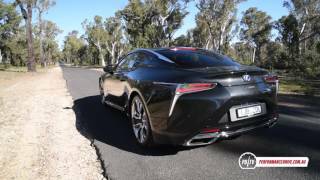 Let us have a close look at the review of the Lexus LC 500h 2017 and find out more about the features it will contain. 0-62 mph (sec. ): sub 5 sec. The interior of Lexus LC 500h 2017 has slight changes from the previous Lexus models, no doubt are all luxurious and well versed. It contains two-tier dashboard, soft surfaces, and the door trim sewn in high-quality hand stitched leather and Alcantara, accompanied with tremendous craftsmanship all around the interior. Cross-sectional shape of the new steering wheels is changed to provide better grip and twisting of the wrist. Adding more standard, it contains multimedia infotainment system and the audio system with standard equipments. Ultimately all these features enhance the driving experience for the passengers. Thus rounding up the interior details of Lexus LC 500h 2017 I would call it comfortable, luxurious and spacious. Exterior of the Lexus LC 500h 2017 has a gorgeous look, as compared to its predecessors. Its elegance appearance makes it to compete against the Mercedes-Benz S-Class. The front fascia of the LC 500h comes with blue badges front and rear which set it apart from conventional versions. There’s an aluminium front hood and fenders, aluminium door skins mounted on carbon fiber structure, ultra compact LED headlamps and forged alloy wheels. The rear lamp of the model is really unique with L-shaped LED lamp that creates the exceptional three dimensional impressions. Thus rounding up the exterior details of Lexus LC 500h 2017 I would call it both sportive and elegant. Lexus LC 500h 2017 contains 3.5-liter V-6 gasoline engine which makes total output 295 horsepower and 350 nm of twist, while the electric motor makes the total output 354 horses. The electric motor generates better acceleration helping it to achieve 0-62 mph within 5 seconds. The model is also being engineered to maintain its centre of gravity, maximizing the comfort to the driver. Toyota gives a peculiar choice by introducing the four-speed automatic gearbox mounted at the rear of the hybrid. So, Lexus LC 500h 2017 will provide more sporting and engaging driving experience with its enhanced and modified inputs.